Social Game Testing : VALTES Co., Ltd.
We also offer high quality to quick delivery social games! Social game testing has become a rapidly growing area for us in recent years. The quick development and short-term delivery demanded of social games has engendered a need for specialized testing. At VALTES, we offer high quality testing to meet short-term delivery demands. We dedicate a team of specialists to conduct testing for social gaming such as card games, social media such as SNS and entire platforms not just in Japan but overseas as well. We maintain a large stock of various smartphone devices including Android and iPhone and tablets like the iPad for use in testing at our test center, but we also loan out smartphone and tablet devices or bring required devices to client sites to respond to specific testing execution needs. We dispatch specialist test engineers to customer sites, and not only test executors but also test designers and test leaders. Additionally, we also comply with team and on site requests. At our test centers (Tokyo & Osaka), we carry out testing in teams centered around our bridge engineers. To respond to the unique short-term development cycles and quick delivery demands of the gaming industry, we are able to conduct testing around-the-clock, 365 days a year, increasing or decreasing personnel as necessary on a daily unit basis. Testing can be conducted through global partner business tie-ups in major cities of 26 countries in the world. We conduct Japanese game localization testing along with overseas game and localization testing. We conduct tests related to billing indispensable to the business model of social gaming. We have credit card use in place to enable actual testing of billing environments. As part of localization testing of Japanese games, we conduct operational environment testing of games in actual locations overseas as some tests must be conducted in such locales for proper confirmation of such things as network environment connectivity, operational speed (including Wi-Fi) and SNS language display. For more about consultations or quotation requests, please feel free to make an initial inquiry. We have established a complete test process built upon many rich years of experience and performance in the field of software testing. We offer a full suite of testing services from optimal test planning for social games to summaries. 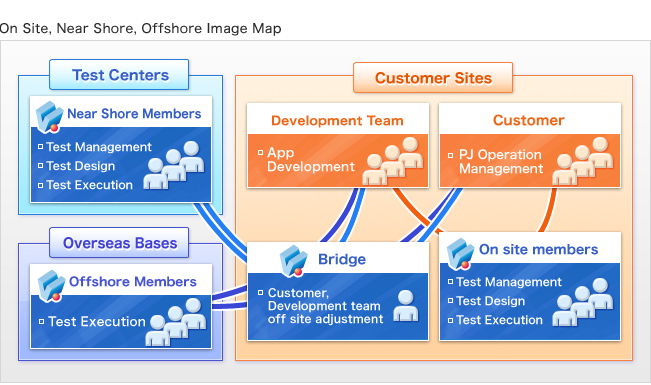 We respond flexibly and nimbly to customer needs including taking tests back to our test centers (near shore), QA operations on customer premises, collaborating with development teams, test center bridges (on site) and overseas testing (off shore). We maintain a replete environment for social game testing including secure test centers, a wealth of testing devices and account settlement framework. At VALTES, we retain over 100 smartphone and tablet devices ,and continue to acquire the latest devices when they are released. We also loan out smartphone and tablet devices or bring required devices to client sites to respond to specific testing execution needs. We have built secure test centers for testing social games which require high pre-release confidentiality. We enforce a highly secure admittance and exit management system through high-security locks. We assure high security by restricting facility access based on user history and project-related personnel. We guarantee peace of mind in handling of pre-release products. Not just for physical security but to ensure comprehensive security, we acquired ISO27001 accreditation in 2008 for system construction. We put in place structures along with personnel education and controls to assure security.